"It's wiser to agree rather than to disagree - even if you do disagree"
Transiting through the Middle East is complicated at the best of times, no matter which approach is taken. The complex situations regarding the on-going chaos and volatile upsurges are challenging from one day to the next. Visa issue and duration of stay will solely depend on one's nationality. Keeping one's political agenda and comments out of any conversation with locals should be adhered to at all costs! One-sided heated debates can turn nasty quickly without any compromise to negotiate reconciliation. The Sunni, Shia and Israelis all have their own points of view. Most foreigners passing through their turf will have biased opinions in one way or another, which in most cases will be different from the locals. Splinter factions are the most dangerous to show any disrespect towards. It's wiser to agree rather than to disagree, even if you do disagree when transiting through regions that are volatile with insurgency or contain radical behaviour. 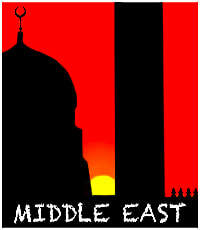 ​In saying this, the Middle East has many positive sides that reflect the crossroads of history. Ancient ruins abound with relics from bygone eras that have left their footprint as solid from the day they were constructed. Getting around the Middle East visiting ancient ruins and archaeological sites depends on the amount of time one has. The easiest historical locations to visit are in Israel, Egypt, and Jordan. Over-landing through these three countries are simplified with open border agreements. In saying this, returning or entering into Israel will be met with security measures with baggage checks. Any foreigner travelling overland through Iran via Iraq or Syria to the Israeli border should expect a questionnaire grilling, especially for those who have stayed in Iraq or Syria for long periods. Some foreigners have been turned away at the Israeli border posts, because of extended stays in these counties. Reaching the ruins of Baalbek overland can only be done via the Syrian border into Lebanon, or by boat directly from Cyprus to Beirut. The ruins of Babylon are situated around 95kms (59 miles) south of Bagdad, and can be reached overland through open borders from Iran, Turkey and Jordan. Over-landing from Jordan or Syria to Iraq is still classified as a Red Zone. Overland transit through Iran is relatively easy, including hitchhiking. 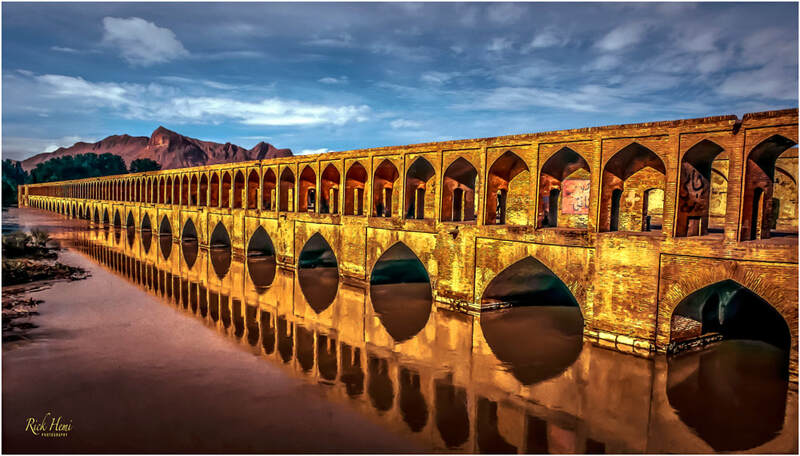 Tourism in Iran is at its highest levels since the Shah days. Persepolis is one of the major attractions in Iran. Here's a good in-depth up to date link for those heading to Iran. Egypt has numerous archaeological sights spread up and down the country. One will need plenty of time to visit them all, which will take about a month. Israel is the easiest country in the Middle East to travel in. The country has transportation connections in all directions with three overland border crossings into Jordan, one to Egypt, and a direct sea link to Cyprus. 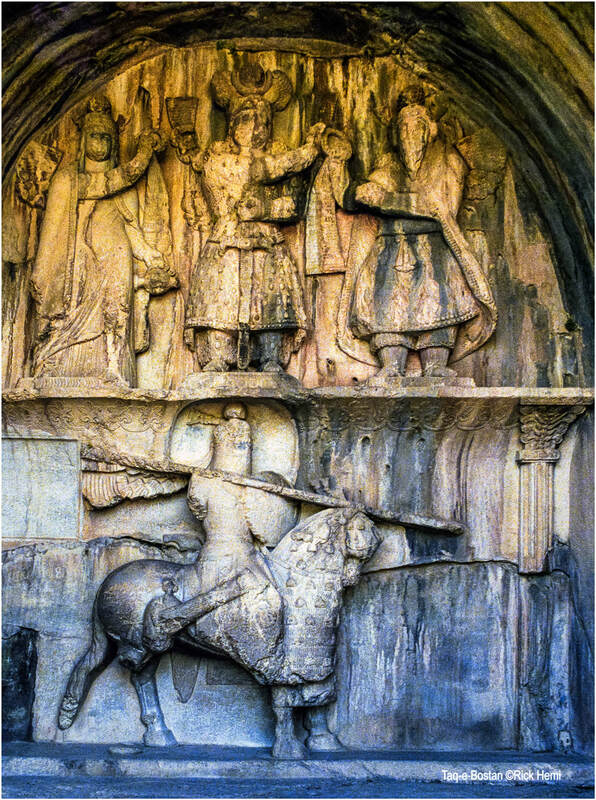 One of the oldest depictions of a bas-relief in Iran. It dates back to the Sassanid Empire (591-628 BC). The bas-relief is relatively in good condition for its age (4x6 m). It shows King Shabdiz and nobles out on a deer hunting expedition. There are other historical ancient relics in the Kermanshah region. 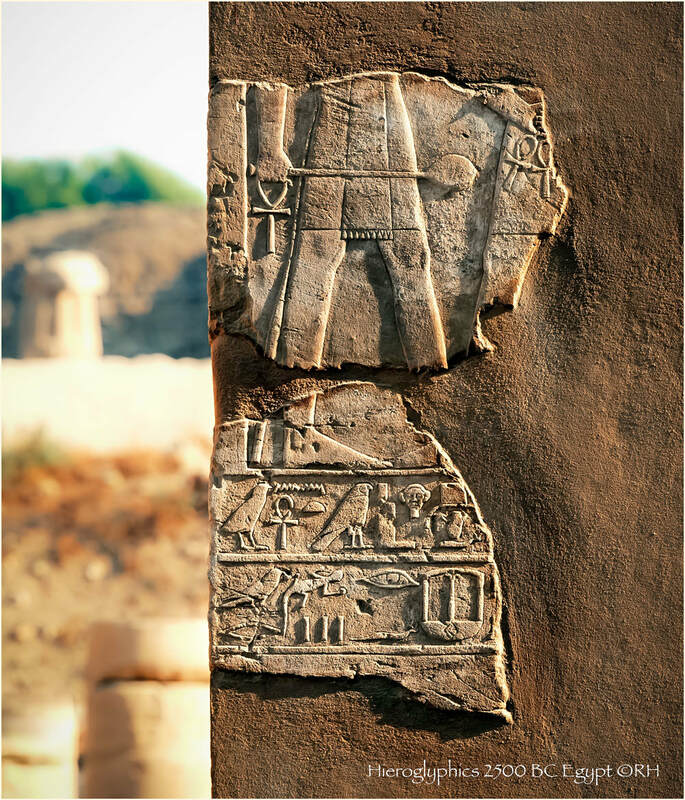 The amount of ancient archaeological sites in and around Luxor will keep most occupied for at least a week. 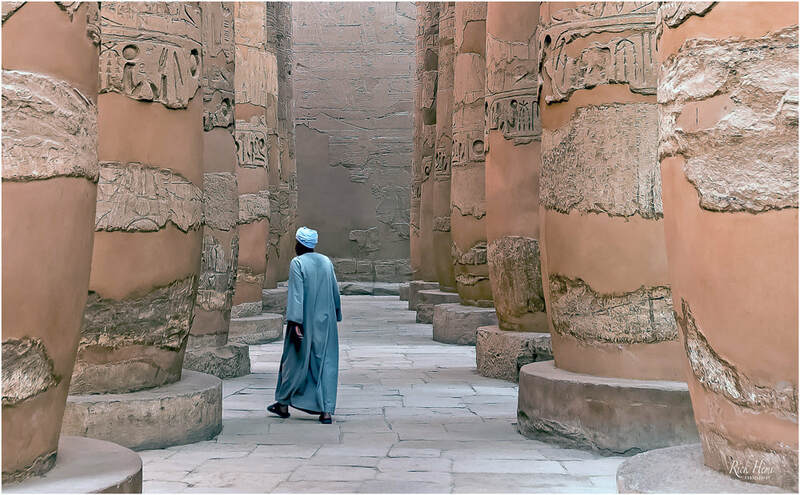 A few of the main historical sites are Medinat Habu, Temple of Hatshepsut, Valley of the Kings, and Karnak Temple. Hiring a bicycle to get around is an option. Early morning up in the air in a balloon is trendy, although it's at your own risk. For great views of Luxor, a climb up behind the Valley of the Kings complex to the highest point is worth the effort. 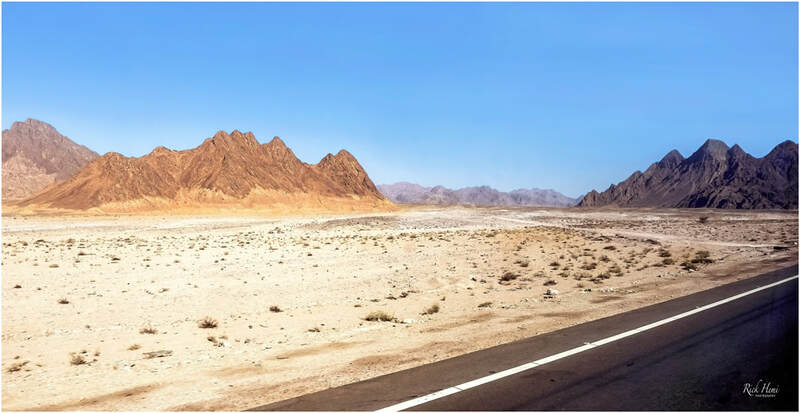 The transit journey using local buses from Luxor to Hurghada on the coast, and onward to Suez to the Sinai shouldn't be missed. 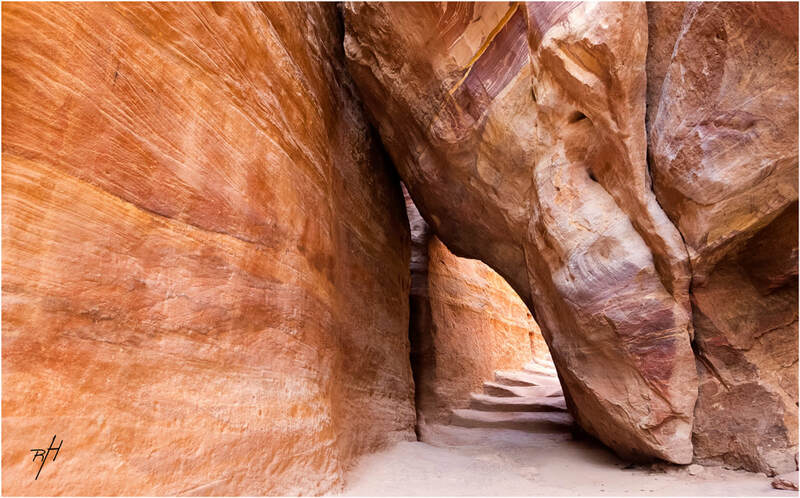 A favourite location for many revealing the first glimpse of the pink pastel pillars of the Treasury temple in Petra. 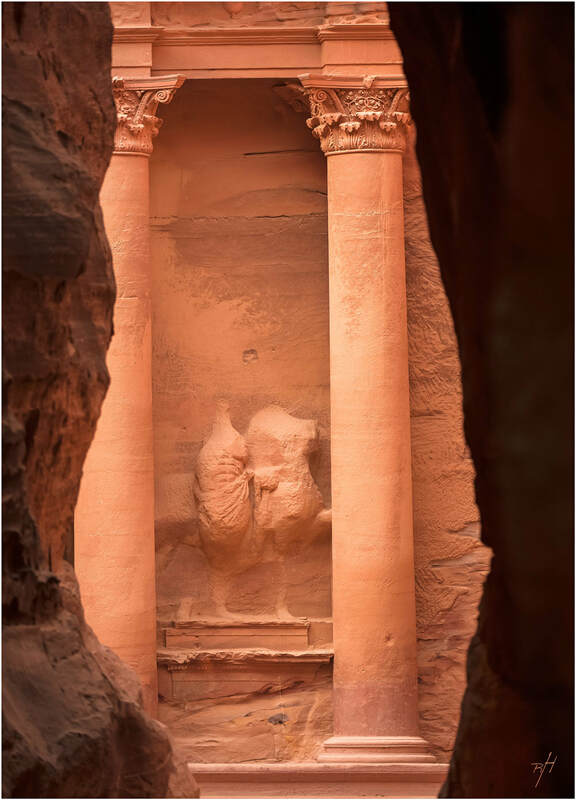 The Nabateans, a group of nomadic tribes were the grand designers of Petra dating back as far as 2 BC at the height of the Nabatean culture. The historical complex became a world heritage site only in 1985. Before then, Petra was unheard of with very little tourism. Early and late morning visits on a 3 -5 day pass is recommended. 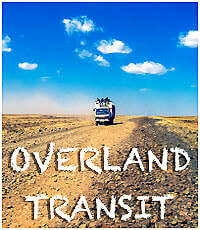 Main overland transit routes through the Middle East are either from Turkey, Pakistan or Egypt. Due to the ever changing political climate within the Middle East all directional transit routes chosen should be rechecked well in advance before departing from the following cities or countries. Cairo to Amman via the Sinai : Iran to Turkey via Iraq : Islamabad via the Khyber pass, through Afghanistan to Mashhad : Aden to Amman via Saudi Arabia : Kuwait to Turkey via Iraq : Beirut to Tehran via Damascus and Baghdad. All above overland transit routes are done at your own risk! All overland travel and transit journeys through Yemen, Syria, Iraq and Afghanistan are within the "Mid East red zone". Random baggage searches, strip searches, confrontal hostile insurgency attacks, and air raids can happen at a moments notice - have a safe journey. 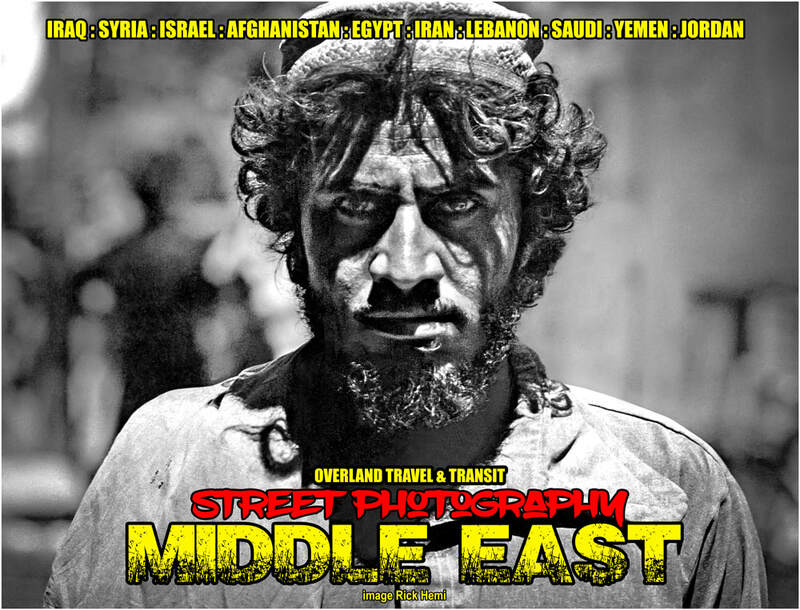 Overland travel and transit through the Mid-East is like a blind maze without knowing where the next terrorist attack will take place within an instant. An attack can happen on the bus you're on, or down a side street, or within a market, or at a hotel, in a hospital, or when eating at a restaurant. The risk of transiting through any Middle Eastern Red Zone region containing direct conflict or insurgency is solely at the discretion of any foreigner who decides to transit through it. The responsibility of being aware, and alert and keeping vigilant is uttermost important for survival of getting through certain regions in one piece. Although, there are some Mid-East countries that are probably more safer than taking a stroll in certain areas of Detroit, London, or Cape Town - like the UAE which is a Mid-East "safe trap" tourist ghetto destination. Beginning a Middle East overland transit journey are from three main directions - Turkey, Egypt, and Pakistan. Personally, I've transited a few times reaching the above countries in different transit directions through the Mid- East. Landing into Istanbul will give anyone a clear overland transit route through to India via Iran and Pakistan if all necessary visas have been obtained beforehand. 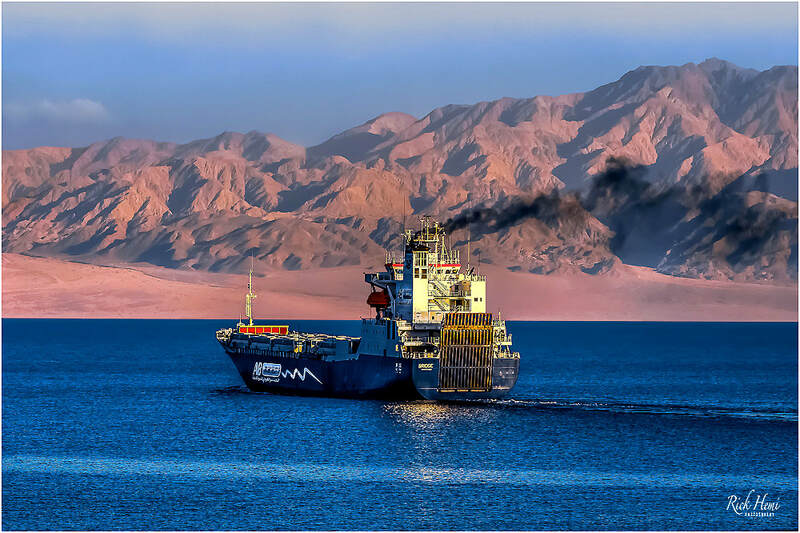 Arriving into Cairo will still give an opportunity to overland through to Jordan via the Sinai through Israel, or by boat from Nuweiba to Aqaba port. Sudan port is another option with a ferry crossing over to Saudi and continuing up the coast to Jordan. In the Mediterranean, ferry boats through the summer operate from Alexandria to Limassol port in Cyprus with a variety of sea routes as follows : Cyprus to Rhodes to Marmaris, Turkey : Cyprus to Haifa, Israel : Cyprus to Beirut, Lebanon : Cyprus to Latakia, Syria : Cyprus to Crete onwards to Piraeus port, Greece. All above routes can be done in the reverse direction. 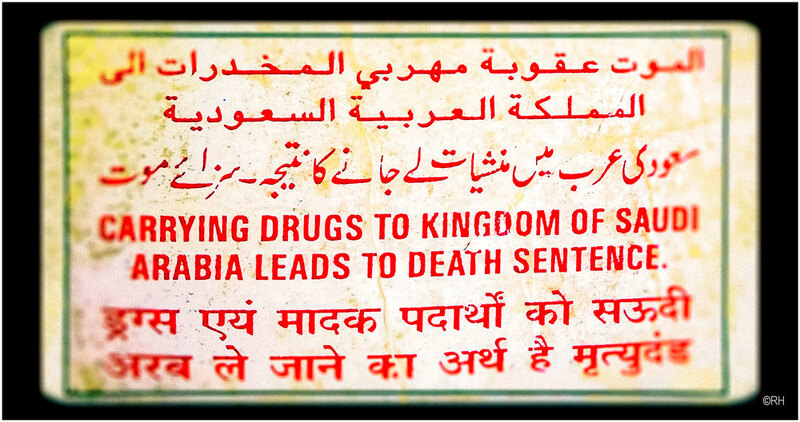 Getting caught smuggling any type of narcotics or other illicit drugs into or out of most Middle Eastern countries will either end up as long lengthy jail terms in a hot jail cell, or losing your head on a chopping block, or hanged. Saudi, Iran, Egypt, Pakistan, UAE, Jordan, Iraq, Kuwait, Bahrain, Oman, and Qatar all have severe penalties for drug smuggling. The Iranian government as of Sept 2018 had stated that they may consider moving towards softer punishments for drug smuggling, although this may or may not have any bearing with western foreigners caught with large quantities of drugs. The best advice if you want to keep your head on your shoulders - Don't smuggle any form of Drugs - Period! So, you've just arrived into Beirut, or Baghdad. 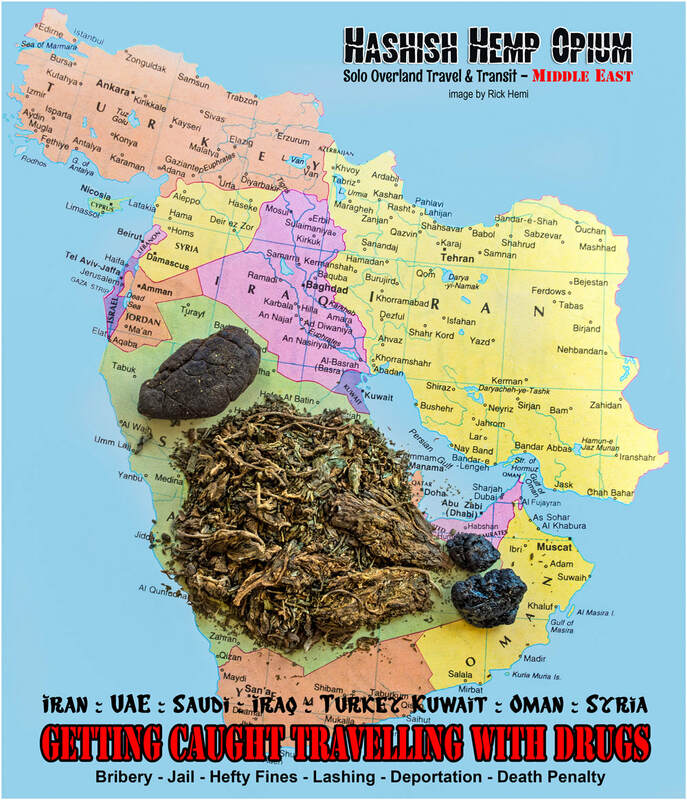 The ease and temptation of purchasing some local Hashish, Opium or Ganja is readily available with most foreigners already acknowledging this. Small-time drug sellers hit you-up on the street, offering quality grades of Hash with a free bag of Ganja. Other street hawkers spot you from a distance, pulling from their pockets quantities of raw Opium - for unbelievable give away prices. This is how it is, an endless soft-drug supply readily available that most western foreigners cannot resist. The relaxed safety umbrella to divulge and smoke yourself to Pluto becomes easier day by day without even thinking about the consequences that may happen further up the highway. After a week or two it's then time to move on, transiting to another destination overland. Packing the baggage is simple, but what about the leftover hashish, and opium? This is where quite a few foreigners make the grave mistake - packing their unused street drugs into their baggage knowingly what risks could eventuate en-route, but what the hell. All it takes is one routine control check out of 20 check points to be stopped by an official that has already caught other foreigners carrying drugs. He will probably already know where the normal hidden cavities are in baggage, and on person. If caught, even with small amount of soft drugs, a bribe may result - if you're lucky. If it's a group of control officers, the larger the bribe is. What can also happen, is an arrest, into court, and heavily fined or jailed or both, and then deported. A worse case scenario is to be fined, lashed, and deported. The worst possible result is severe - ending in death. 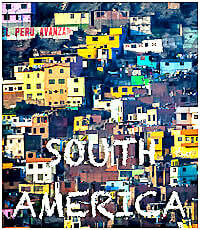 The simplest way to avoid all these scenarios is not to travel overland through any Middle Eastern country with drugs. The supply of soft-drugs in some Mid-East cities are very relaxed, with no one blinking an eye-lid, but don't expect the same treatment leaving town, and crossing international borders into Turkey, Iran, Kuwait or Saudi. Transit routes shown here have been completed personally by me a few times. Main transit routes never change, but depending on internal political issues some routes, Consulates, and Embassies may be closed due to unexpected chaos and upheavals. The entire Mid-East is a Red Zone (except UAE,Qatar,Kuwait) without knowing what could suddenly cause borders to close and road routes to deviate. 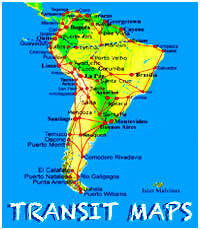 Gathering the latest information on the intended direction of transit is recommended. This is easily done by contacting locals, or foreigners who have recently arrived from any overland route that's planned in the direction they came from. This also includes all overland routes to and from Sudan and Egypt for C.African Rep, Chad, Niger, and Libya. Relying on the internet for the latest information is not advisable within these isolated regions. The issues of having an Israeli stamp in your passport still continues today through most of the Middle East. Many Arab Nations also carry restrictions for their own citizens as seen above, including countries through Africa and Asia (Indonesia, Maldives, Malaysia) as far back as 1948. Having dual passports is an option, but if caught carrying a passport containing used Israeli stamps inside Syria, Iraq, Kuwait, Saudi, and Sudan for example will likely end up with interrogations and deportation. For decades, the Israeli immigration have stamped entry and exit formalities on a seperate paper - if requested. Crossing the Egyptian and Jordanian borders with an Israeli stamp in passports is not an issue. Applying for any future visas for other Middle Eastern countries containing a used Egyptian/Jordanian entry stamp issued from the Israeli border may cause a negative reaction and refusal of any intended visa requests - which has and does happen. It's a normal procedure for Syrian, Sudanese, Saudi, and Iraqi Embassy and Consular staff to look thoroughly through every page in passports for an Israeli stamp before a visa is granted - take this as good advice. If you're looking for peace and quiet, the Middle East has plenty of chill-out spaces without another soul in sight. The Egyptian deserts, Sinai peninsula, Wadi Rum, the Negev, Saudi coast, Fars, and Baluchistan all have their own desert wilderness serenity. Overland transit into or out of Afghanistan can be done through 6 countries that border around the country. The direct land border crossing to China through the Wakhjir pass is classified as a grey border that exists only for locals. A Chinese visa maybe denied if the visa itinerary shows the overland route is entering via Xinjiang State. In general, visa issues for neighbouring countries around Afghanistan have limited time validations. The duration will depend on where, and who is issuing the visa. Red Zone regions through Afghanistan and neighbouring countries are alive and well. You can be lucky enough to transit through all these countries without issues, But Red Zones regions all have one habit in common - knowing where western foreigners are located. Normally, local chit chat about foreigners spreads like wildfire. The usual overland route which has always been reliable is through Tajikistan, Kyrgyzstan to China, and then via the Irkeshtam pass on the Karakoram highway. Although in 2018, a group of 4 cyclists from the Holland, Switizeralnd and the USA were deliberately mowed down and killed in Tajikistan. 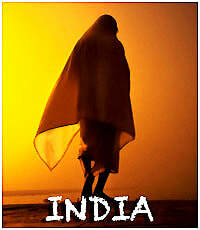 Crossing Pakistan to India is only through the Wagah border via Lahore to Amritsar. Entering Afghanistan from Iran is simple if an Afghani visa has been issued, the route from Mashed to the Taybad-Islam Qala border is the normal route used by foreigners. 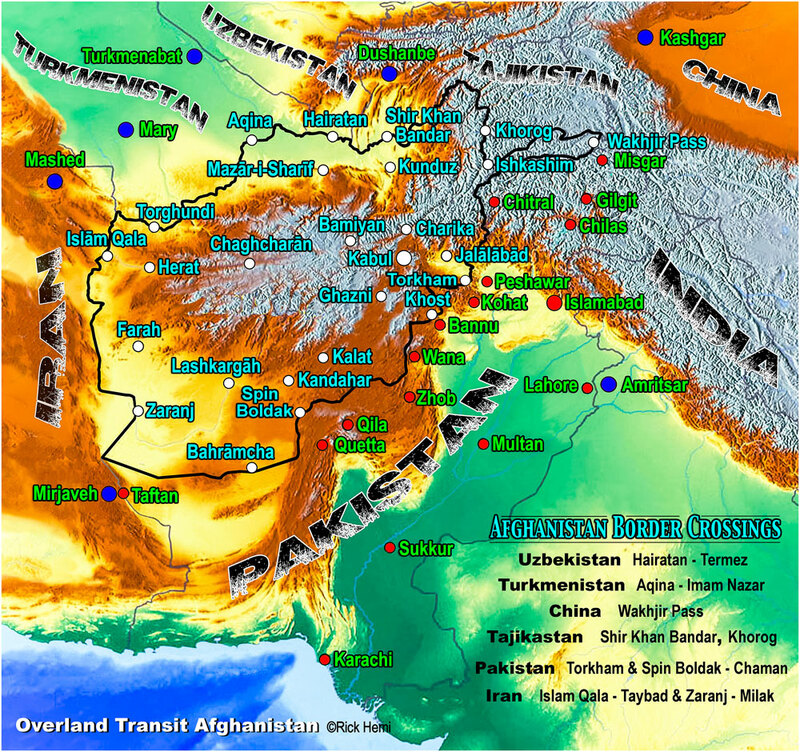 Avoiding Afghanistan completely if overloading through to Singapore is via the Mirjaveh -Taftan border into Pakistan. Some century old habits never die, and are alive and well like these Shisha (hookah) pipes on display. 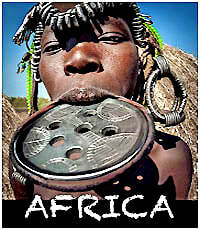 Smoking with water-pipes is a part of the culture and tradition in many Middle Eastern countries. Social smoking can be done with a single or double hookah, and sometimes the need for triple or quadruple hose hookahs are required when groups hang out together in cafes, or at party gatherings. Forget playing chess in the Middle East, screams and shouts with lightning speeds through a game of backgammon is normal sporting behaviour amongst locals. Learning how to play like a shark and join in the fun only takes a few days. 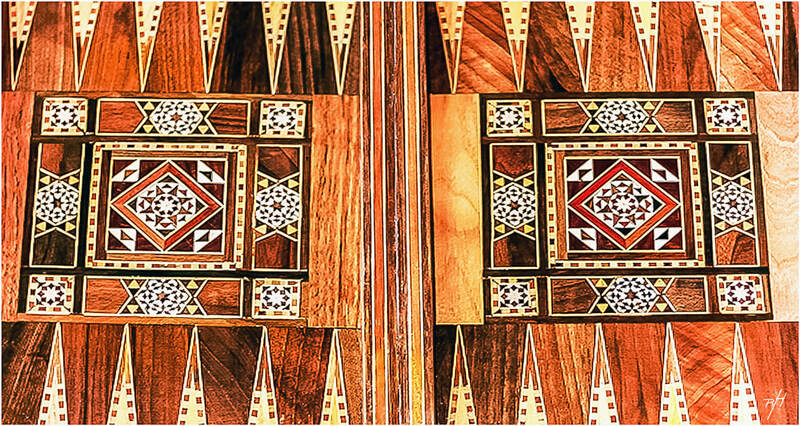 Some backgammon boards are brilliantly designed with artistic flair of mosaic designs. Interaction levels with locals differ through the Middle East region. Capturing close-up snaps in touristic zones in Jordan, Israel, and Egypt is simple and straight forward. Other countries are more sensitive towards westerners totting around the streets grabbing random close-up snaps, and will involve higher interaction skills. Street communication and interaction with locals is different between foreign male and female visitors. Countries that have an internal presence of on-going conflicts between rival Sunni & Shia, including different mixed militia groups are deemed as "Red Zones" and can literally without warning explode into chaos from one day to the next. 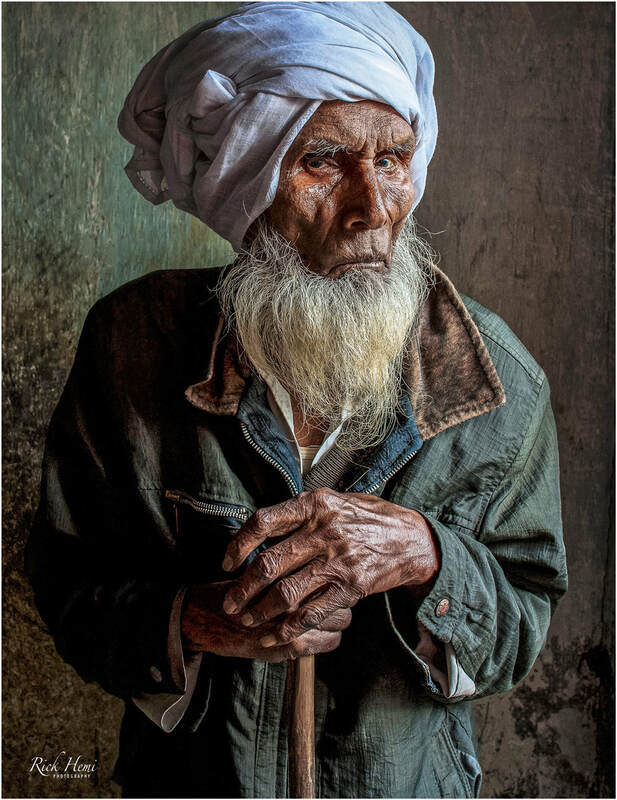 Visiting these regions as a foreigner, walking around with photo-gear is at your own risk, but in saying that, it's these zones that are actually the best places to capture vivid random street portraits of locals and transients. It's advisable to keep some distance away from Mosques in "Red Zones" due to sensitivity. Randomly photographing certain people will have different side effects with onlookers who may also request to be photographed. Don't expect everyone to have open arms with smiles. Capturing snaps of Imams can go either way, but with 4 years up my sleeve passing through the Mid-East, unless positive interaction is implemented, or invited to do so - don't think about it. Street chai shops where locals congregate, or within bustling food and produce markets are the easiest places where the possibilities to capture random close-up portraits can be taken. Everyday on the street is different, you never know what to expect or who you'll meet. 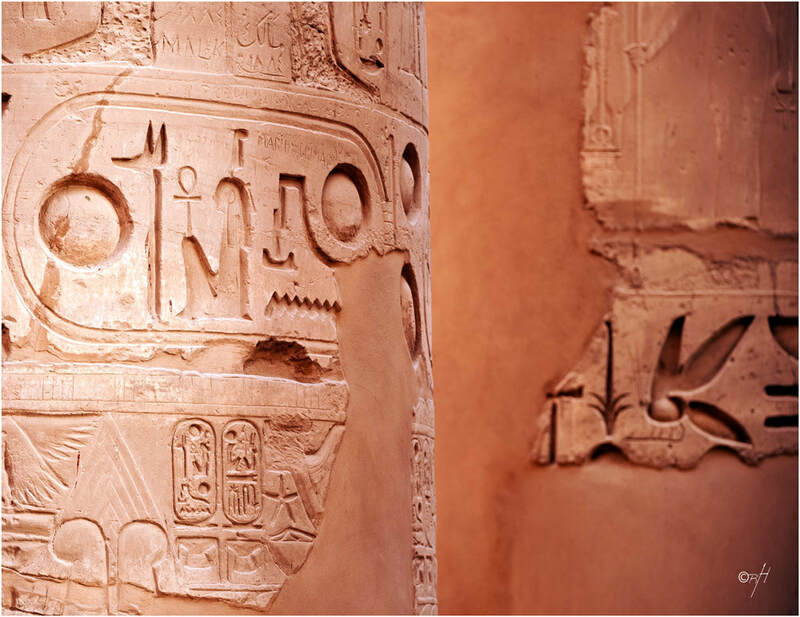 The 4 images show partial sections of hieroglyphics on the last remaining obelisk at Karnak. The obelisk was built by Rameses and has a height of 25m (80 foot). 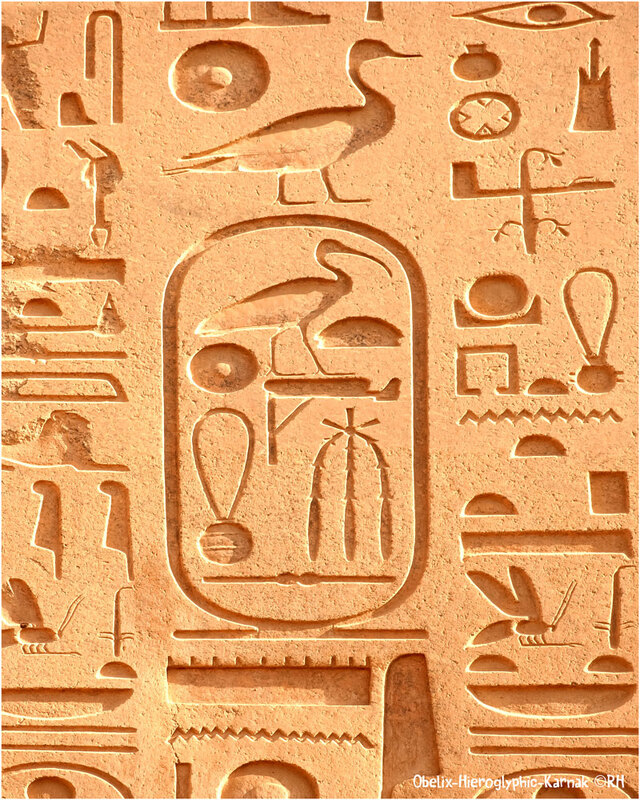 The solid granite was quarried near Swenett, the ancient city known today as Aswan. The majority of granite statues and monolithic shrines throughout Egypt originated from the Swenett quarries. 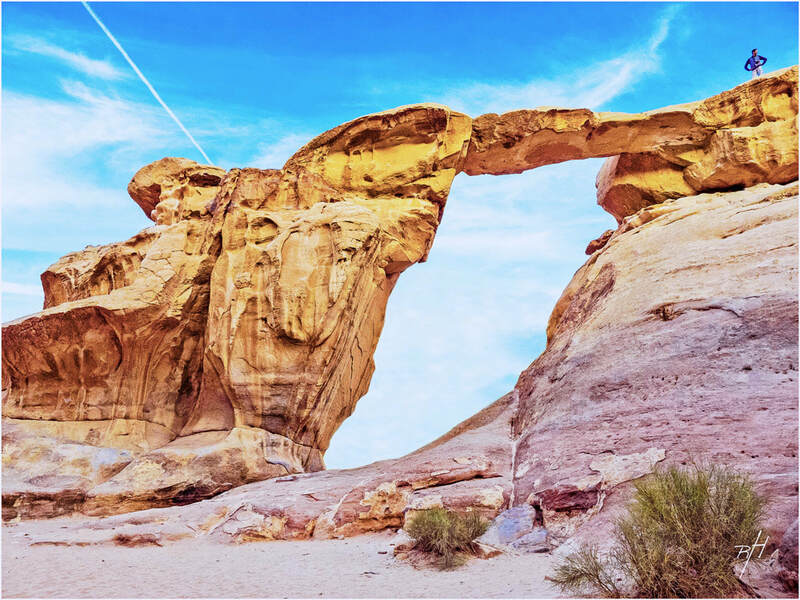 The Middle East has no shortage of desert landscape with some regions being more awe-inspiring than others. 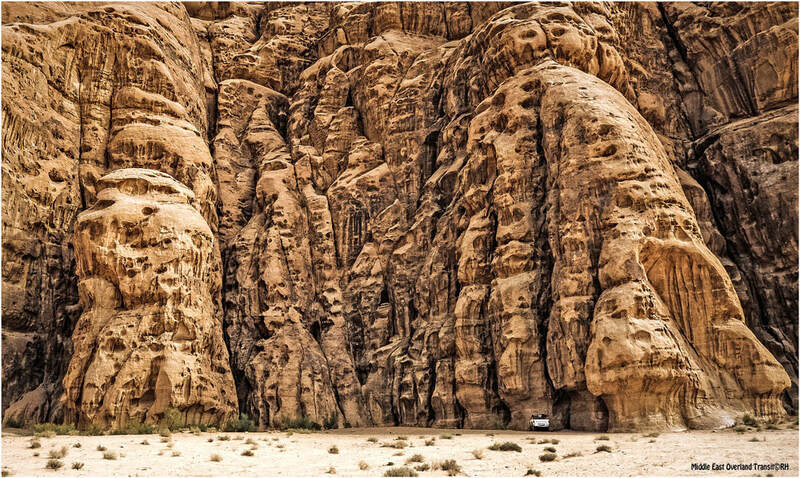 The massive rock cliff formations at Wadi Rum is certainly one of these locations. 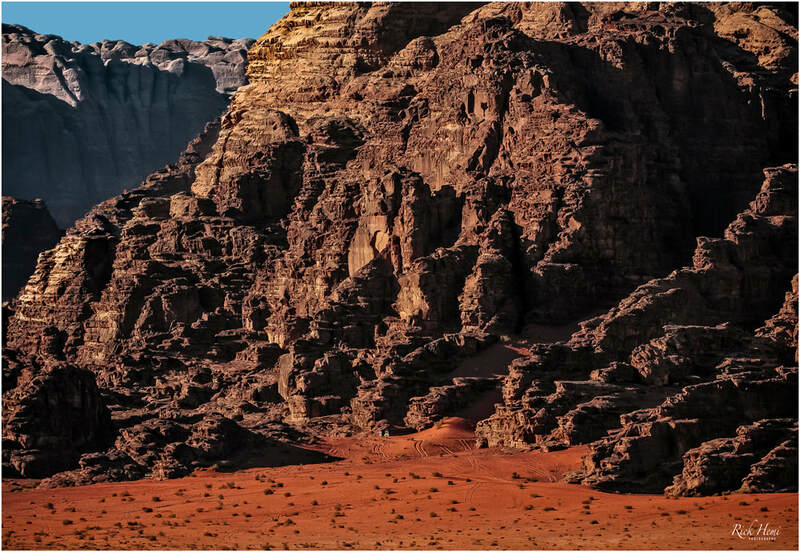 The desert landmass within Wadi Rum is a clash of high rugged cliff faces surrounded with open desert. It gives the visitor endless amounts of panoramic views with brilliant sunsets, and the night sky revealing the cosmos - what more does one need? 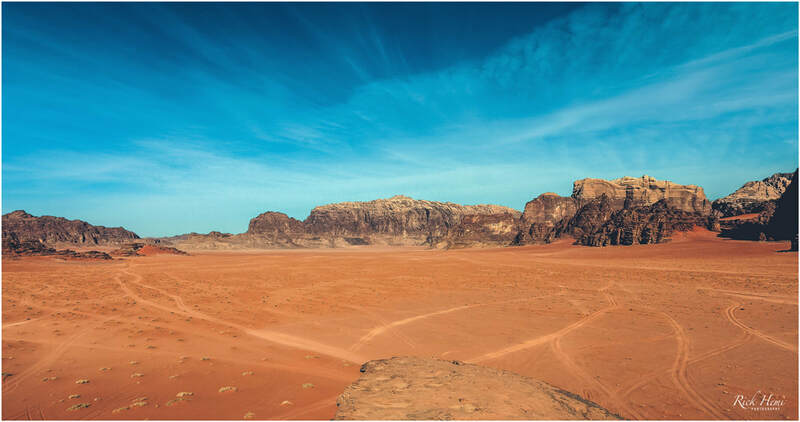 Wadi Rum is a perfect isolated place with plenty of space to relax and chill-out for a week or two. 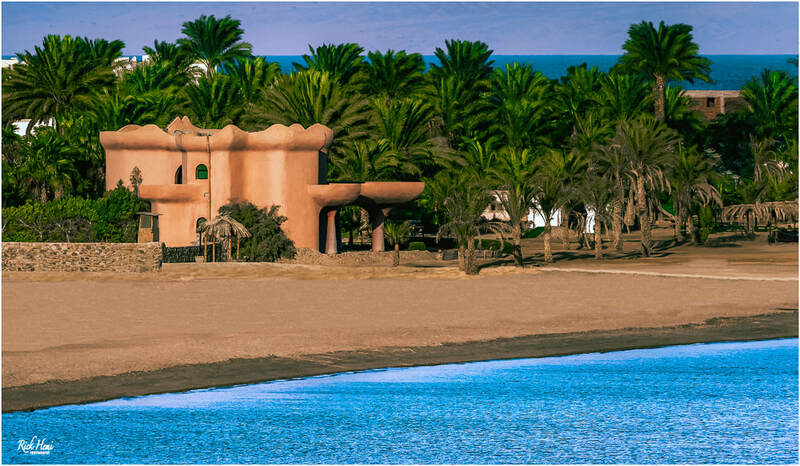 There are numerous camps at different locations, some are very basic, with others offering the full monty with a private driver and lavish meals. Jordan has had an increasing amount of tourism over the last few decades, but this could change rapidly due the tensional strain in Syria, and Israel. The Jordanian economy is also on the brink of collapse with an external debt now surpassing 40 billion threatening political stability. If you're an atheist transiting through the Middle East, it will either harden your atheism, or may open a window on dialogue and discussion on different faiths. Most foreigners prefer to remain naive on ancient doctrine and prefer to absorb whatever historical relics they encounter and leave at that. Unless one has studied and is familiar with Scripture, any debate on different doctrines of faith will become biased, and confusing. Heated debates on religious view points in the West is certainly nothing new, but in the Mid-East this should be avoided. For instance, trying to discuss New Testament doctrine among Orthodox Jews will abruptly end as fast as it started, or asking a Muslim if he/she questions the Quran is an insult. 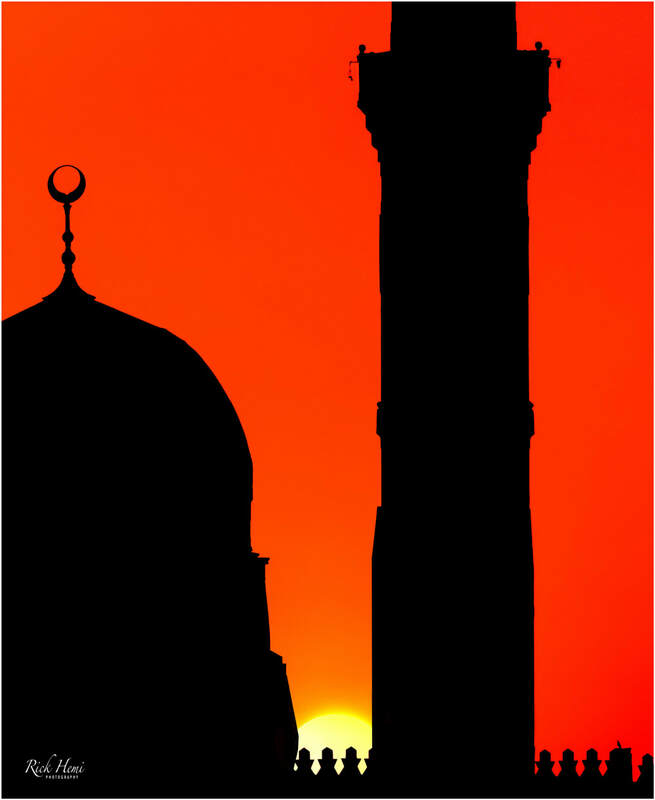 Respecting different belief systems throughout the Middle East is recommended unless locals themselves are open minded to discuss different doctrines of other faiths. Cursing, or defaming any written Scripture from the Quran from a non-believer is regarded as blasphemy. This may result with incitement and jail time. Sharia law in certain countries is taken very seriously with dire consequences for those that cross the line. Non-Muslim foreigners holding hands, or kissing in public is a punishable offence. Foreign female dress mode should blend in just like how local females are dressed in public without exposing the sexuality of the body i.e. loose fit clothing, arms, cleavage and legs covered, including the wearing of a hijab. Males can get away wearing half sleeve tee shirts and jeans. Abiding by local rules and regulations in Iran, Saudi, Iraq, Pakistan, Afghanistan, Yemen, and Kuwait will make a positive travel experience without hassles or harassment. If there's an urge to travel and transit through volatile regions in the Mid-East, it's advisable to get the latest up-dates from locals in areas of intended travel where "New Territorial Red Zones" have established themselves (2019). Transiting through any region along the Turkish-Syrian-Iraqi border may require full-on interrogations and baggage searches. Foreigners who have non-exemption status to visit Israel who have travelled overland through Pakistan, Iran, Iraq and Syria maybe denied entry at the Jordanian-Israeli border. There's no doubt of the Middle East - more wars and chaos reaching unprecedented levels for control and power will continue until there's a winner. But, who will be the overall successor? The stakes are now the highest they have ever been. Russia, the EU, USA, Saudi, Iran, Israel and China have been playing chess with one another for the last few years. Sooner or later there will be no more pawns to play with. Travelling through the Middle East, one becomes accustomed to hearing biased opinions of the Mid-East situation. Verbal debate from all sides of the religious political spectrum from the Iranians, Saudis, and Israelis are usually jagged straight to the point without compromise. Because of their direct individual ties to their own Religious belief systems, any debate will be biased. Traveling through any of these countries will give anyone the feel of isolation towards neighbouring countries. Although there has been peace between Israel and Egypt since 1982, the lack of Egyptians visiting Israel has been less than minimal. Iran has had a hatred for the Jewish state since 1979 when the switch to Islamic rule began it's dominance over the nation. Civil conflicts with affiliated militia groups like the Mujeehadin, al Qaeda, and Hezbollah along with many other splinter groups have kept the Middle East like a hot bed oven. Russia is an example of hi-tailing it out of Afghanistan when the casualty rate became an obvious lost cause. The Iran-Iraq conflict raged on for a decade with a death toll reaching 2 million. One has to ask who cashed in on this conflict and made billions of dollars (Europe). The follow-up US invasion into Iraq, and Afghanistan created the Middle East into a cesspit of uncontrollable waring factions that led to the creation of Isis. The fall of the old monarchs in Syria, Iraq, Libya, Iran, Afghanistan, and Egypt hasnt made the Middle East any safer than what it was 4 decades ago. China, the latest player, along with the EU, Russia and the US all have high stakes through the Mid-East linked directly to Oil, gas and sales of military supplies. China's belt road through the Middle East is a poor excuse if I ever heard one. Militia proxies are over-flowing and continue their conflicts backed-up and supported by big Government. They're funded and supplied with unlimited amounts of arsenal via their alliances to the Sunni or Shia belief system. Meanwhile, Christian minorities throughout the Middle East have now become the spoil of attrition with persecution and sporadic culling and cleansing without anyone blinking an eyelid. The hate of the Israeli nation has been around since Israel was created in 1948. Today, one has to ask, if Israel were a non-Jewish nation, would there be harmony in the region? or would the Middle East still have issues with inside itself pointing the blame game agenda in different directions. Political and religious agendas are impossible to separate in the Middle East for the survival of any government to remain in power. The Europeans and Asians have certainly been drunk on Middle Eastern gas and oil for decades, and require both spices to survive. The new Russian oil pipeline to Germany may become a stumbling block in either direction, only time will tell. ​The future of the Middle East is an impossible task to speculate on, but the entire region is about survival without compromise towards other Religious beliefs with each one predicting a Messiah to usher in peace. "Smart Phone Cameras are great for location snaps - A DSLR is Far Superior"
Have you ever regretted arriving at a location without photo-gear? Over the years I've met many that have, and had wished they had brought something that was able to capture images far more superior than a smart phone camera. This isn't a bash at smart phones, because I use my own smart phone to snap-off random images at most locations. Most cameras today come with Raw format which are large files that can be manipulated when post processing with photo editing software like Lightroom or Photoshop. The Middle East is certainly one region that's well worth the investment and effort to travel with a camera. Egypt, Jordan, and Israel have enough temples and historical sites for those who are considering or contemplating to purchase photo-gear. 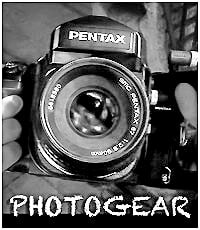 Don't leave home without having at least a fixed lens body, or a DSLR with a few lenses. 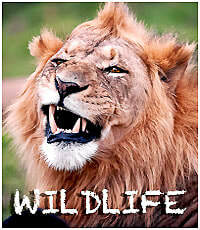 Imagine all the awesome image captures that can be mounted on the wall in canvas or glass. The Mediterranean side of the Sinai has lost all credibility as a safe overland transit route, including the interior by-pass road from Taba to Suez due to various militia groups running amok doing their thing. I have passed through the Sinai many times, and have also free camped in various locations over the years. A surplus food and water supply is required if venturing alone. The coastal side of the Sinai along the Red sea is still "a safe zone" (2018) which has good diving spots near Dahab. The only issue free camping without a tent in the Sinai are the snakes, and scorpions, and the odd wild dog wanting your food scraps. Image: A part of the mountainous desert formations between Dahab and Nuweiba situated along the Red Sea peninsula. Open markets, side street chai stalls, and bazaars are good locations to find local subjects to photograph. Like I've mentioned several times through this website the importance of interacting with locals will usually give positive results for close-up street portraits. This local showed his ID as proof that he was actually 110 years old, probably one of the oldest persons I've interacted with and photographed. It's advisable not to photograph women unless it's by invitation or consented to do so! Any region globally no matter where it is, one has to interact with people to get close-up snaps. 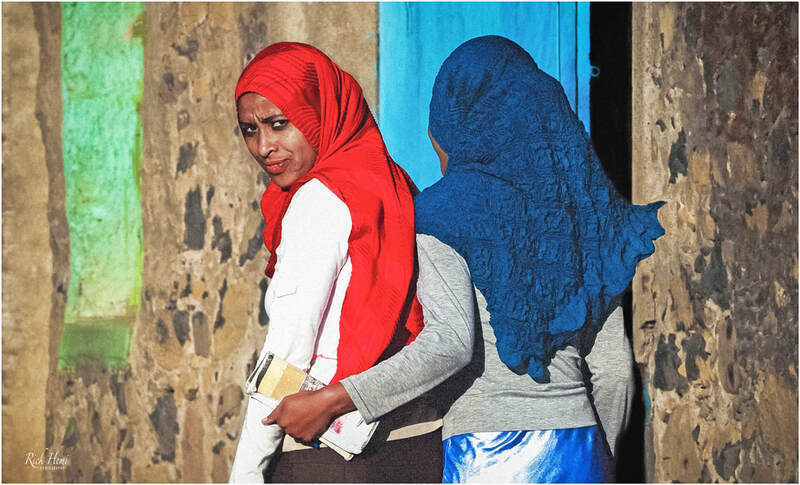 The Middle East is no different, but with one rule that should be adhered to through the entire region - Never photograph women unless by invitation or consented to do so. Photographing women is normally a taboo unless you're a female yourself holding the camera. It's always advisable to follow the local rule of law as a foreign visitor concerning any close-up portrait snaps of females in public. This will guarantee freedom from being harassed or abused by the women themselves, or from their husbands. I've witnessed first hand a few foreigners who did cross the line taking street snaps of Muslim women. They had received aggressive warning threats, and were forced to delete any images that were taken. Others have had their cameras smashed by aggressive police, because of taking images of poor street people living in squalor. Sticking and abiding by Mid-East rules is the best option to avoid trouble. Mid-East locals take street snaps of each other all the time, but they already know how to abide by their own rule book. These are cautionary measures and valid in Saudi, Iran, Syria, Iraq, Yemen, Pakistan, and Afghanistan. It's also advisable to avoid taking random street snaps throughout the Middle East in sensitive zones like military compounds, navy ports, government buildings and certain airports. Mild Mid-East countries like Jordan, Israel Egypt, northern Lebanon, UAE, and other Gulf States that have established tourism and contingents of foreign workers are much more relaxed towards street photography. 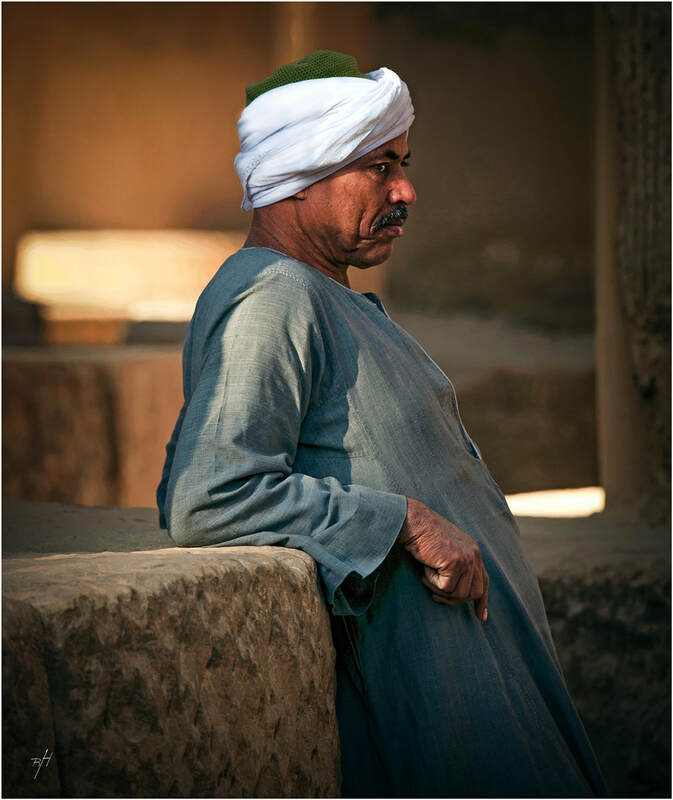 Arab male headdress is known as the keffiyeh or shemagh and used as a protecter against strong sun, sand, and wind.The style of headdress reveals the wearer’s nationality, status, and religion. Tribes throughout the Middle East normally wear their own traditional colours. A plain white headdress with a black aqal are commonly seen and worn in Gulf States. Red and white Keffiyeh are heritage colours of Saudi, Jordanian and Palestinians. Black and white keffiyeh are mainly worn by Saudi and Yemeni. 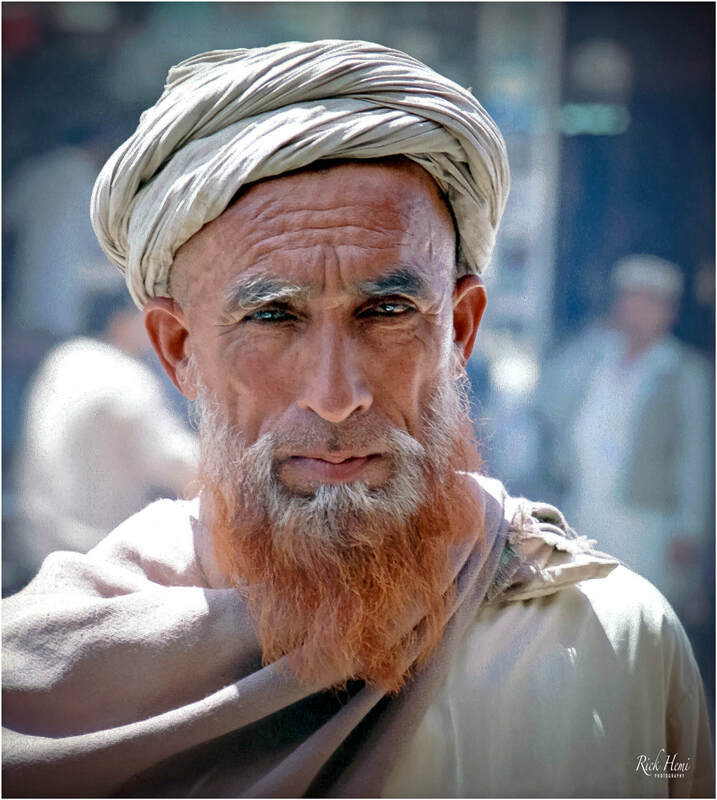 Turban cloth head wraps like in the below image are traditionally used by Shia Muslims, and can be seen worn by locals scattered throughout the Middle East from North Africa through to Pakistan. Tourist overflow in the UAE, Jordan, Israel and Egypt make fine examples of easy interaction with locals. Stepping out of these countries, and into Iraq, Syria, and isolated regions in Afghanistan and Pakistan has a rougher edge on the streets. Blending in as a foreigner dressed like locals will go a long way in non-tourist zones. This opens a quicker dialog of formal chit-chat with individuals, and avoids creating an entire street watching every move one makes. Learning some basic Arabic, Farsi, or Urdu - which isn't difficult will also add positive reactions and interaction. Capturing close-up random street portraits with strangers like above then becomes reality. With good interaction skills, one can be lucky enough to photograph some vivid images. 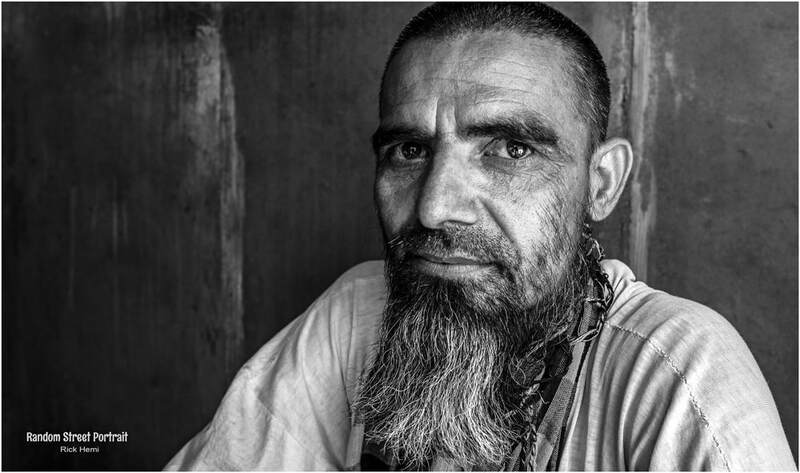 Street photography within the Middle East is unpredictable most of the time, but there are occasions when a local like the above will give you the option for a quick portrait snap before disappearing into a crowded market. 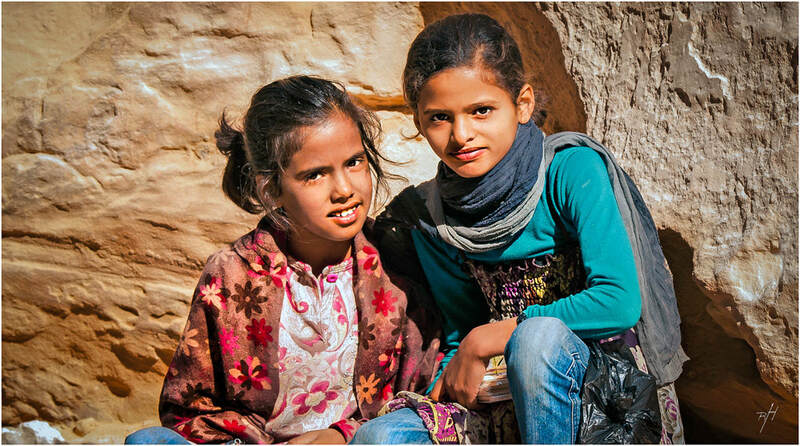 The majority of locals through the Middle East are generally photogenic having a mix of shyness with a touch hardness at the same time. Locals who resent to be photographed will certainly pre-warn you well in advance with hand signals and a serious look across their face - don't cross the line. 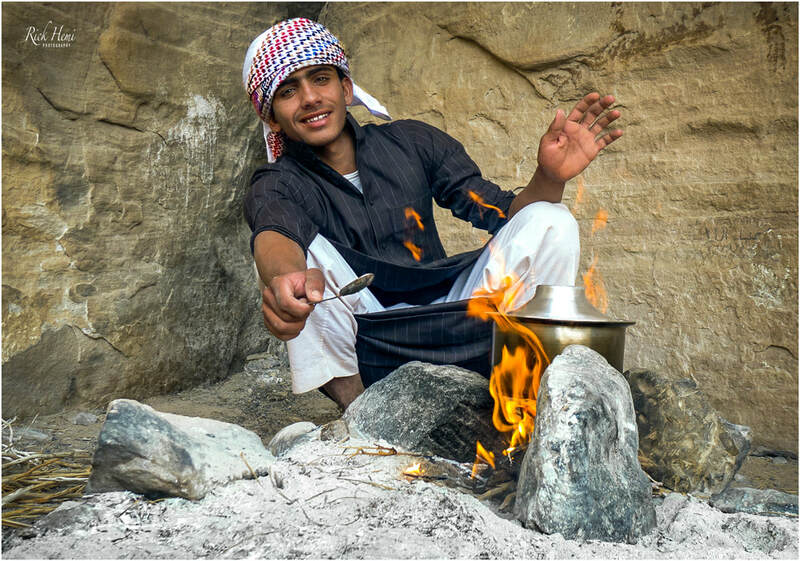 Bedouins are nomadic Arabs who still inhibit desert environs throughout the Middle East. 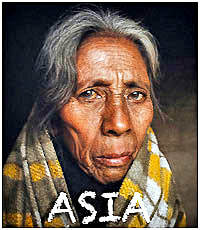 They are known as desert dwellers, and have their own clans, tribes, and land territories. 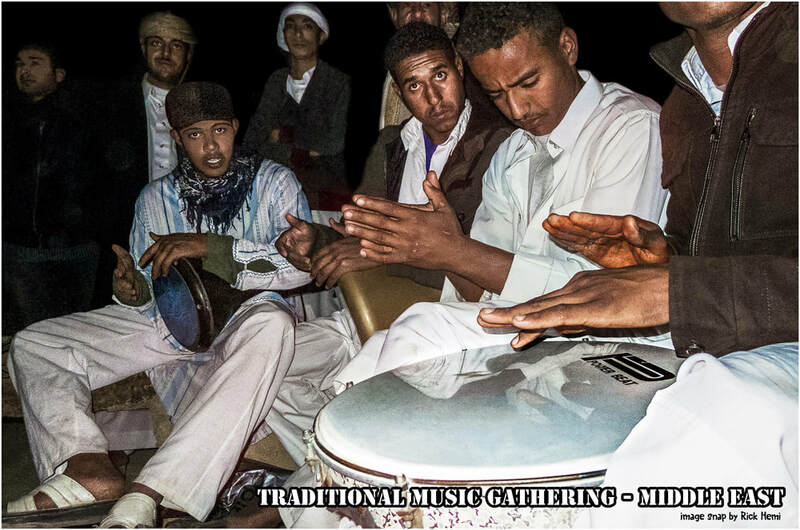 Their roots and history are traced back to Biblical times known as Qedarites in the Old Testament. A classic snap during an early overland visit taken during the Russian invasion of Afghanistan. 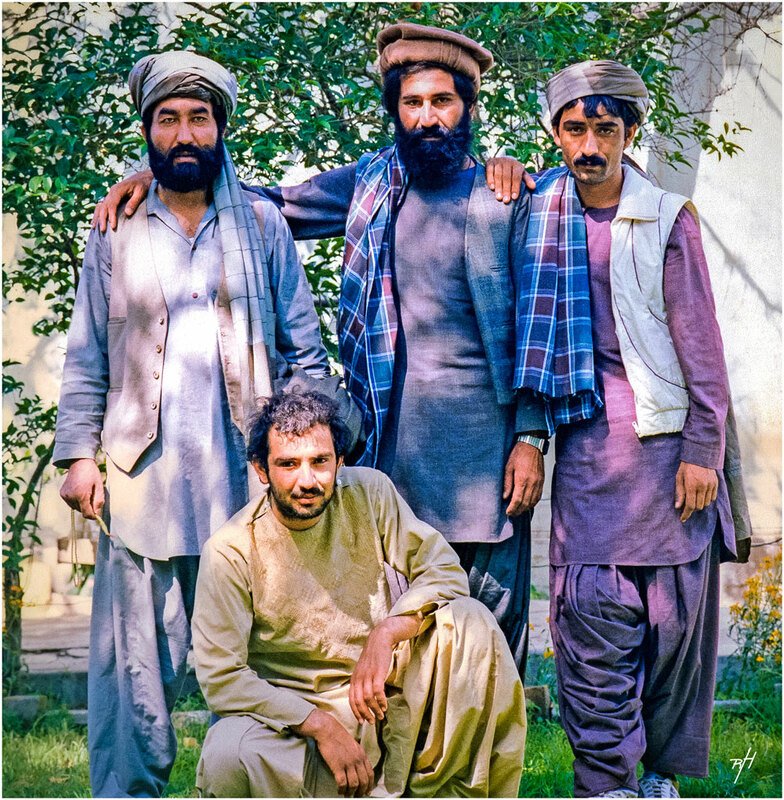 These Afghans were gathering medical supplies for their comrades. The war effort against Karmal and Soviet troops with the help of foreign military aid eventually managed to force the Russians to retreat from Afghanistan, although heavy casualties among freedom fighters and civilians were in the ten's of thousands. In total, the Soviet invasion in 1979 led to a decade-long war that killed over two million people. The destruction of almost the entire infrastructure of the country took its toll within a very short time period. The Afghanistan conflict still continues today amongst rival war-lords battling it out for supremacy against the established government. The overland route from Mashed-Iran through to Kabul to Peshawar via Herat has been open to foreigners for some years now, with a trickle of westerners heading east who have been lucky enough to have received onward visas into Pakistan, China or to India. Transiting through the Middle East one finds plenty of hospitality, although it will really depend on your personality, preferences and interaction capabilities with locals. Keeping biased opinions on political issues and religious debate should be contained, unless agreed upon before any open conversation with locals. Invitations to sit at a tablet to share a meal, or to be invited joining a group sipping chai and smoking shisha is quite common. This opens up all types of conversation and chit-chat. Some locals will even go out of their way to offer a place to stay if they have room. This occurrence happens travelling through the Mid-East. Invites from uni students, artists, writers, shop owners, and others may surprise many through Iran, Saudi, Syria, Jordan, Egypt, Pakistan, and Israel. This also opens up a door for an added bonus to visit places that are off the beaten track that most foreigners don't know about. Basic interaction skills are a must, and will certainly go a long way normally ending up with positive vibes. You don't have to go far to visualise and capture stunning sunrise and sunsets in the Middle East, just take a quick stroll outside somewhere that has clear visibility an hour before. The majority of desert landscape from Iran through to Egypt offers stunning washy pastel colours on the verge of dusk. 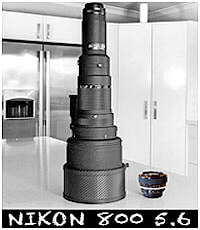 A tripod is recommended for low light captures which eliminates vibration at low shutter speeds. The Middle East is like one great tribal zone with some regions stuck in time. In general, most Muslims will go out of their way to assist or help foreign visitors. As always, precaution, using street instinct, and remaining vigilant are the key factors travelling through the Middle East. Any transit route direction that's decided should be thoroughly scrutinised in advance of any road trip departure before heading towards, or through any Red Zone region. Asking locals of the latest updates of an area to visit, or to transit through is a priority. 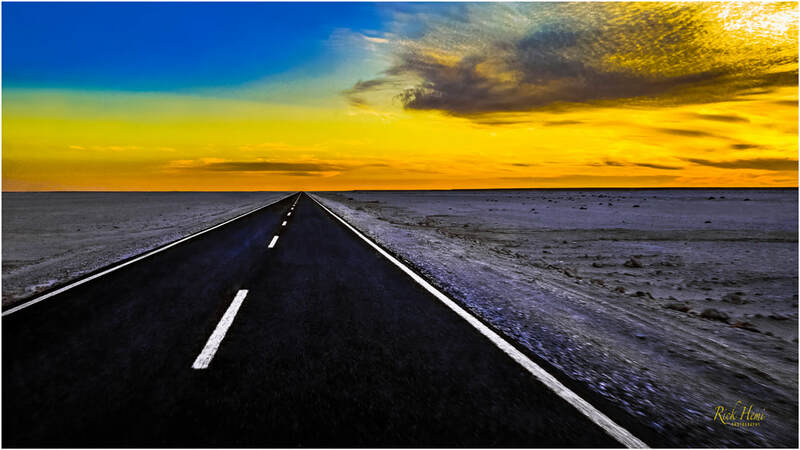 Many highways through the Middle East resemble, and look like long landing strips without seeing a vehicle in either direction for hours. These desert tarmacs can turn into military highways at the drop of pin to move mass amounts of armour quickly if any conflict arises along the border line. Image: The main highway cutting through the Great White Desert en-route from Alexandra to Siwa oasis - situated 50kms from the Libyan border. The historic Pharaoh Rameses II monument at Abu Simbel, Southern Egypt. 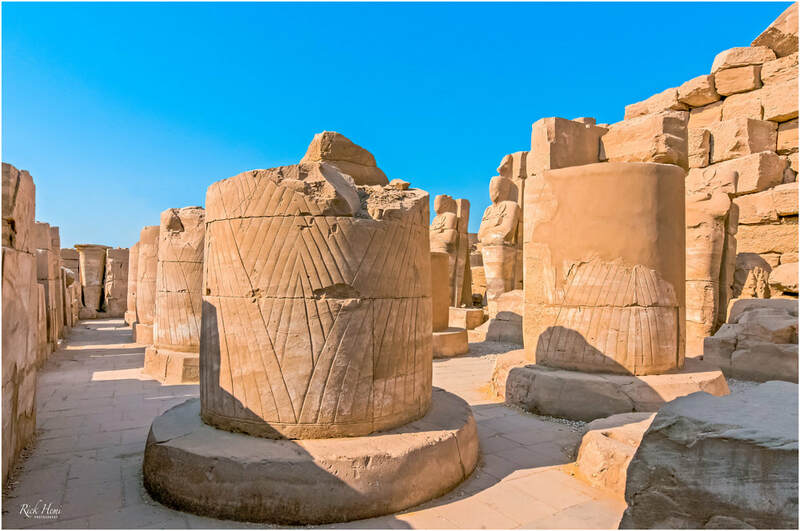 The ancient complex was constructed after Rameses defeated their Nubian neighbours to show a dominating presence of Egyptian authority in the region. Rameses in various historical records show he was the third pharaoh of the 19th Dynasty​ (1250 BC). The temple was discarded and abandoned in 6BC, and rediscovered in 1813 by a Swiss orientalist. Is it worth a visit? In my own opinion, yes, if you're already in Aswan. An overnight stay at the location is beneficial before the complex becomes crowded with tourists. Crossing international land borders like the above is simple enough if one has the appropriate visa that allows passage to pass over. 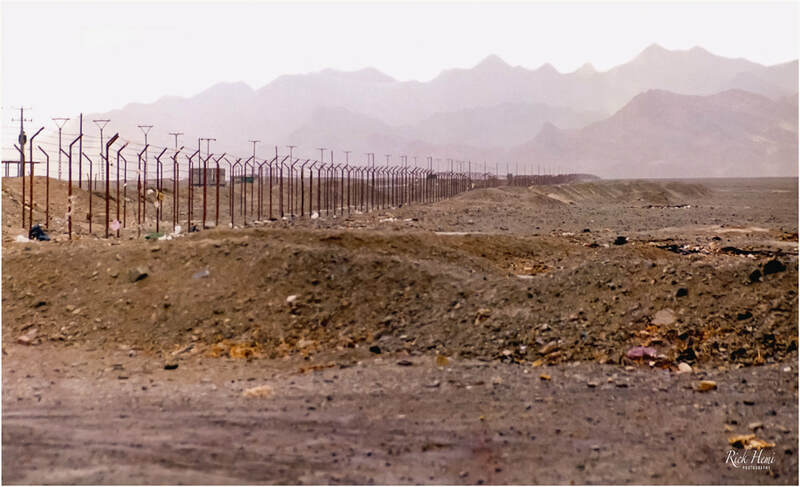 The border security fence was constructed by the Iranians decades ago and heads northward towards the tri-borders (Afghanistan, Pakistan, Iran). Smuggling has always been an issue in this region especially across the remote Granite mountains in the distance. The Baluchistan province is known to both insurgents campaigning for an independent homeland, and drug cartels smuggling Afghani opium and heroin to global markets. The region has of late been a cash cow for smuggling Iranian diesel across to Pakistan. Loads of diesel fuel are packed on mules and transported through the mountains. A litre of Iranian diesel is approximately 15 cents a litre which is cheaper than a bottle of mineral water. 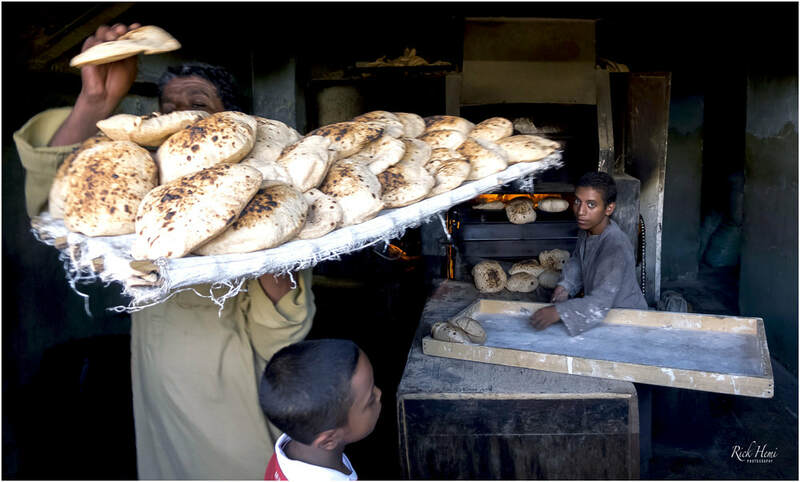 Hot and fresh direct from the oven, naan bakeries are seen throughout the entire middle East with some bakeries offering a variety of different flavours with ingredients of garlic, butter, or spices. You can smell a naan bakery street blocks away - just follow your nose. The ancient site of Persepolis by Darius is situated north west of Shiraz. It's one of the major historical attractions in Iran. 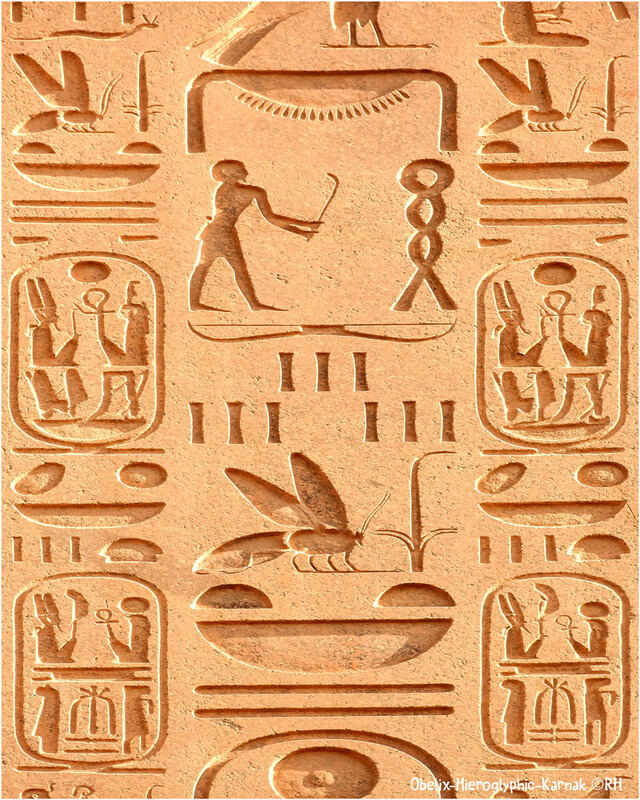 Many of the original bas-reliefs have survived through time spanning over 2500 years. 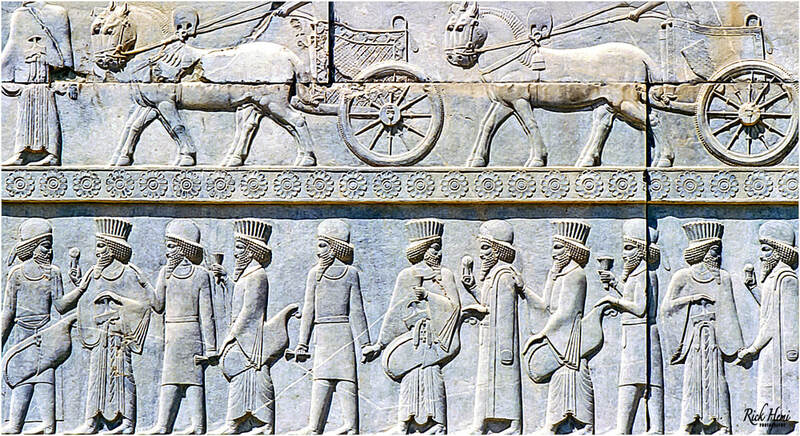 The image above shows Darius era bas-reliefs (518 BC) displaying horse chariots and noblemen chiselled from solid marble rock slabs. Petra was virtually unheard of until Hollywood productions used the ancient ruins as a follow-up sequel of Indiana Jones. In the 1980's Petra was relatively free from any heavy tourism overload with no regulations or restrictions. My first visit to Petra was back in '83 when one could camp, and sleep freely anywhere they wished. The original hollowed out baths from solid rock were still overflowing with spring water out of the ground just like they were 2300 years ago. Today the original Petra springs are non-existent, and have totally dried up. This is what happens when tourism cash dollars is pushed to the limit. In saying that, the Petra complex is still worth a visit, preferably in the "off-season" if there is one. 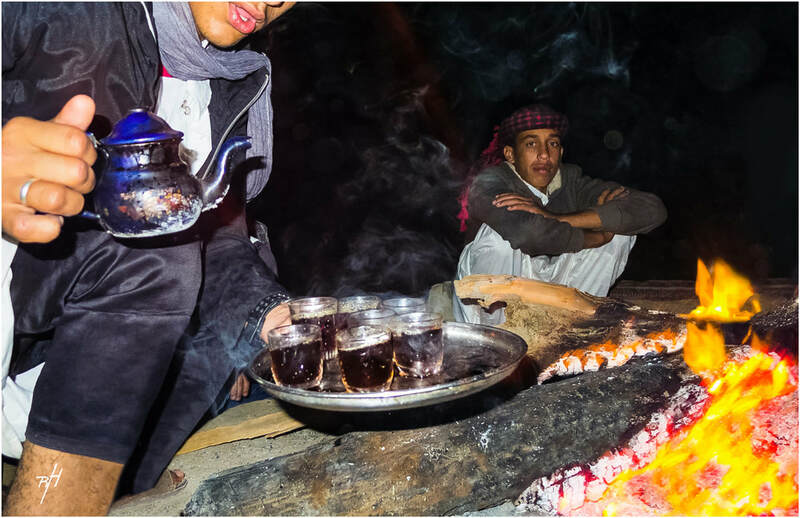 When alcohol is forbidden the taste of sipping a hot chai around an open fire in the middle of the desert becomes a normal reality. Arabian chai in the wilderness is usually prepared and mixed with a ton of sugar. 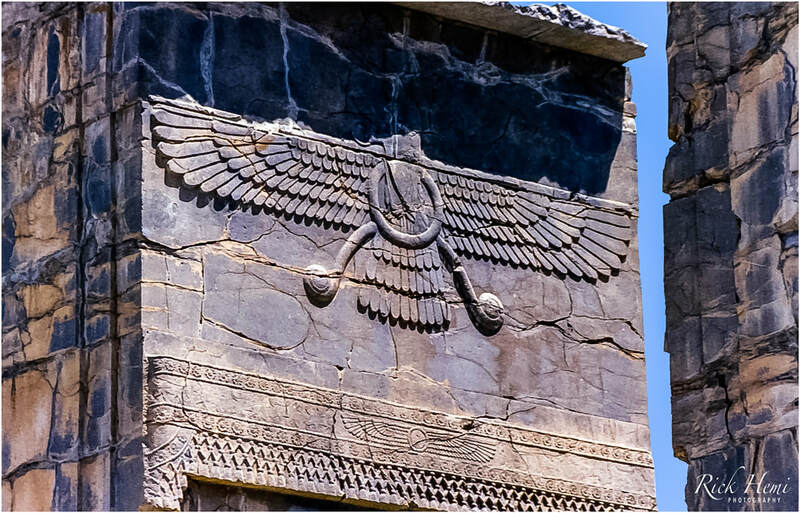 This is one of the earliest bas-reliefs depicting a winged disc through ancient history which still remains in its original form and position that dates back to 518 BC at Persepolis, Iran. This unusual design of what most are led to believe depicts a large phoenix or eagle that's either rising or about to land. One question arises why the relief was designed with circular pods instead of talons? They look more like landing pods. The best time for a peaceful camel ride around the pyramids is in the late afternoon three hours before closing time. Most visitors flock into Giza early in the mornings. Try avoiding this unless you don't mind 100's of other foreigners scattered in the foreground and background of all your snap shots. 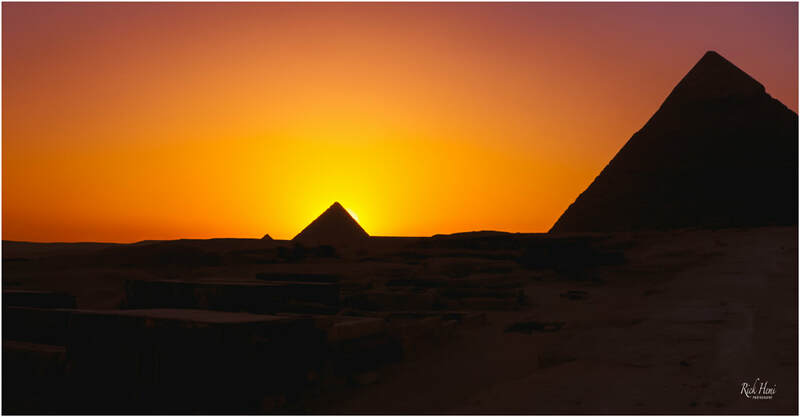 A great time to visit Giza complex is of course just before the sunset. This can be difficult with security police trying to chase you out the gate. How things have changed. On a previous visit to Giza in 82, it was relatively easy to pay $5 bucks Bakshesh and scale up Cheops. The views on top are ever-lasting, including the morning sunrise. 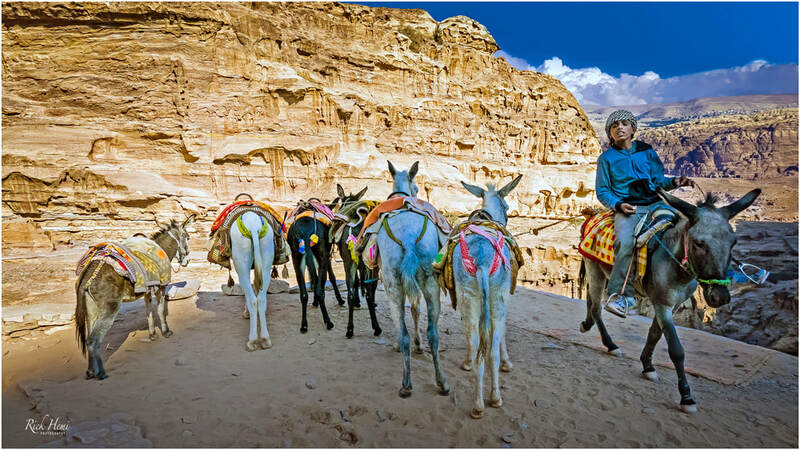 Mules and camels are still the most common four legged animals used for transporting cargo in remote regions. 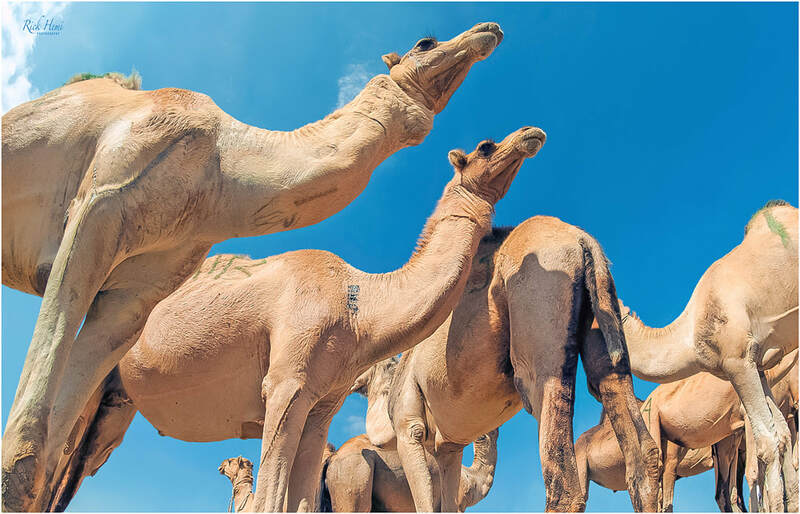 A camel can carry more than half of its weight all day long through blistering heat without flinching or complaining. Mule and camel owners certainly know the value of their animals with most ensuring there's enough feed and water at hand. If you're game and have the time, a camel can be bought or hired, and used for travel through sections of the Sahara in Tunisia, Egypt, Morocco, and Chad. 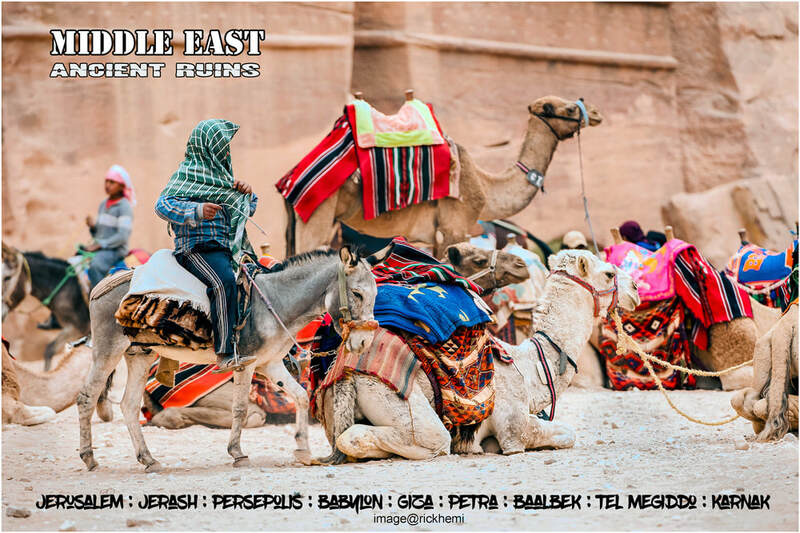 The most difficult place to get to in the Middle East is the region of Gebel-el-Lawz and Horeb (the real mountain of Moses and split rock). 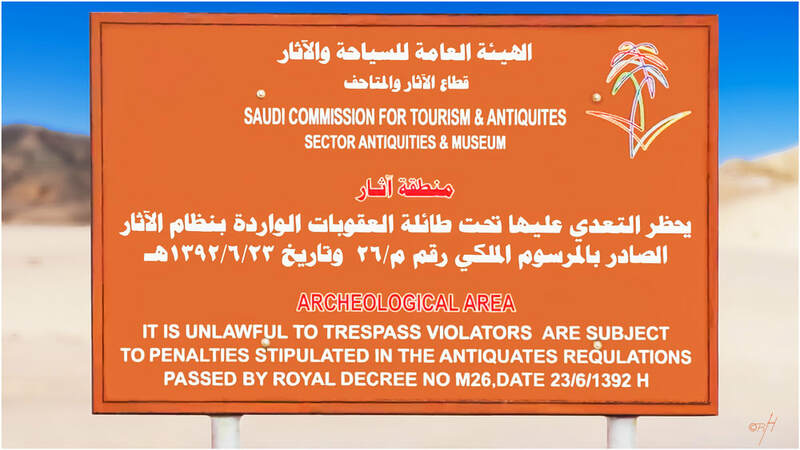 For the moment, an official Saudi visa with the right permits are required to visit inside this area. 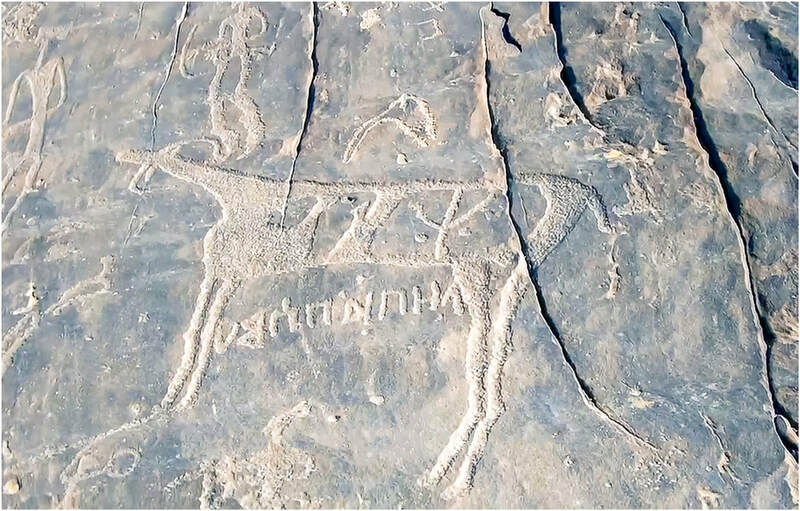 There is word that the Saudi government will soon open the entire archaeological site up to foreign tourism in the near future. 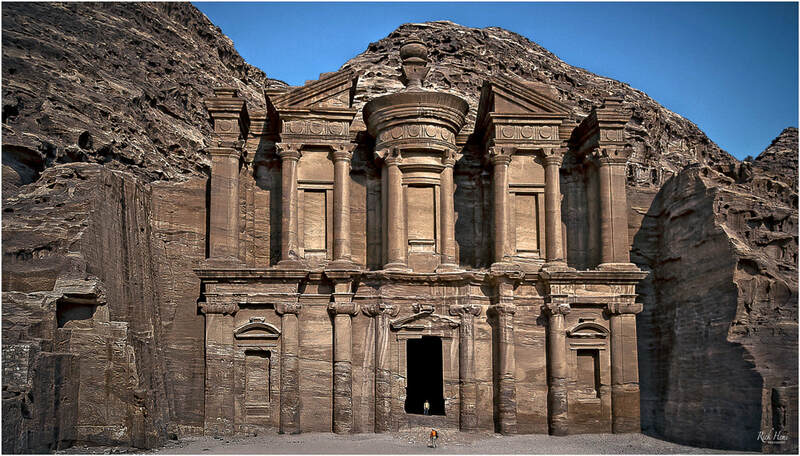 It then will become the one of the most sought after ancient locations to visit in the entire Middle East. Why you may ask? because of the direct connection to the Biblical timeline period of the Hebrews wandering 40 years through the wilderness. Moses black top mountain (Mount Sinai), Elijah's cave, 100's of original petroglyphs of animals, menorah, and footwear, including paintings depicting ancient Hebrew script, including the original sacrificial alter where a golden cow was worshipped - all here in this location. 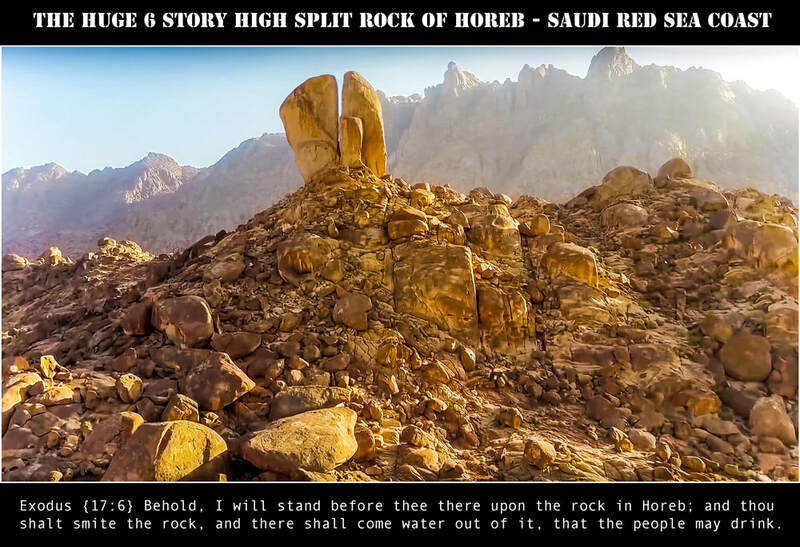 ​The 6 story high split rock of Horeb perched on a small hill is the icing on the cake which clearly shows water did gush out from it by the smoothness of the rocks below it. Bedouins living in the area will become aggressive if you're seen crossing over into fenced off areas that are prohibited to stop artefacts being damaged by visitors. Most historical sites in the Mid-East set their own rules and regulations which can limit the time of taking certain images when the light exposure is correct at certain angles of monasteries subdued in shade. Using filters is a good remedy during midday when the sun is directly vertical. Desert haze can also be an issue. Planning and working out the best time to photograph anything without shadows or reflections depends on timing, and where the sun is positioned. A second visit maybe required to certain locations to grab snaps with minimal shadows. Some foreigners are shopping addicts overseas, I'm certainly not one of them. There's a huge assortment of different souvenirs in Egypt. 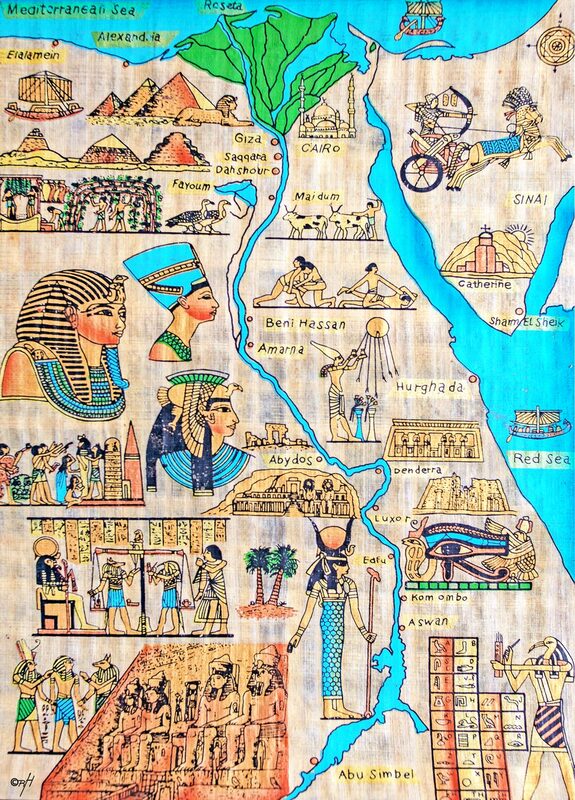 Water coloured hand done drawings on papyrus are probably the lightest item available. Great for gifts for those who are into hand done products.